Entrance is not particularly appealing as there is a lot of building going on nearby and itâ€™s near the London Heliport but the staff were friendly and helpful. Room was clean and modern, bed comfy but the carpet needed replacing as it was threadbare in places and had bleach stains. Service was good in the bar and breakfast was varied, could have done without the staff rearranging furniture though. Would stay here again. Short walk to Clapham Junction. Thank you for choosing Crowne Plaza London Battersea. Your feedback is important to us and we use it to train and guide our staff in the hotel. Once again thank you and we look forward to welcoming you back to stay with us. 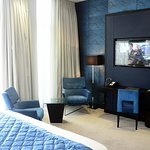 A great hotel that is outstanding value for London. It's across the river from the main attractions but we took an Uber to the Kings road for Â£6 and one to the Natural History Museum for Â£8. The rooms are fantastic, huge comfy bed and the bathroom was slightly larger than an apartment I lived in in the 80's! Breakfast was a buffet, great choice both hot and cold, very friendly staff in fact all the staff are excellent. David at reception went the 'extra mile' and we were made to feel welcome as soon as we arrived, nothing was too much trouble. This really is a great hotel! Free upgrade to a Executive Room which was nice. Most importantly very friendly staff and the food was very nice the breakfast was fresh and hot tasted great I would easy pay Â£20 plus for the breakfast and itâ€™s a buffet, Also note fresh fruit not tinned fruit which was a bonus.And when your eating Breakfast itâ€™s on the Riverbank and have nice views. The sauna jacuzzi and gym was nice. Thereâ€™s no swimming pool it doesnâ€™t bother me.The room was massive his and hers sink. King size bed. The Bath Tube you can sleep in there it was that big. And separate shower. Honestly Iâ€™m looking forward to my next stay. You can watch the Helicopters take off and Land because itâ€™s next door. Avoid this hotel at any cost , this is my suggestion . I paid a price of a 5stars hotel for a room that is not even a 2 stars . Wi fi is complimentary because itâ€™s not working . Mini bar is empty. No hair dryer provided . The only â€œluxuryâ€ is an old kettle with some bags of Coffee and tea. I have been in much cheaper chains hotels and the quality was way better . The entrance is really dodge and you have to walk in through a dark road that it doesnâ€™t really feel safe during night time . I was so annoyed and angry I didnâ€™t use the facilities . The minibar is empty because is as per guest request to be filled up. The hair dryer is located in the second drawer inside the wardrove. Please feel free to contact me and I will be happy to discuss your stay and to make sure you will have a great experience next time if you decide to come back. Last minute decision to stay the night. Great location beside the Thames... there is a helipad next door but seemed very quiet, maybe because it was the weekend. Room was clean, good size and well equipped. Good strong hot shower. Very clean. Breakfast was varied with menu for special orders at no additional cost. Thank you champagnetastesco for choosing Crowne Plaza London Battersea.